Research conducted at ELVER is focused on understanding morphological, physiological, and behavioral evolution. We have a special interest in studying the mechanisms guiding diversification in vertebrate clades whose members have evolved an elongate and limb-reduced (or complete loss) body plan such as snakes, anguilliform fishes, and other eel-like vertebrates. When attempting to understand the evolution of diversity in disparate vertebrate groups, I consider the functional interaction between body plan and feeding behavior. Why I study feeding is pretty self-explanatory. All organisms need to consume food to survive and some of the most fascinating behavioral innovations have evolved for organisms to do just that-feed. Some of the more awesome behaviors are tied to modifications of the hyobranchial complex such as the ballistic tongue of bolitoglossine salamanders and chameleons and moray eel pharyngeal jaws (see below). But why the elongate limb-reduce body plan? This body plan has evolved multiple times across disparate vertebrate groups and it poses many challenges related to feeding. These challenges include an increase in surface area-to-volume ratio, a relatively small mouth that must sustain a long mass, and no limbs or extremely reduced limbs so food manipulation is challenging. My interests lie in documenting how these vertebrate groups cope with these morphological and physiological challenges and understanding what kinds of advantages these organisms my confer (physiologically or behaviorally) from elongating their body and reducing their limbs. 1. Pharyngeal transport in the reticulated moray, Muraena retifera.Arrows point to the pharyngeal jaws. Radiograph revealing position of the pharyngeal jaws in relation to the skull (a). Radiograph revealing extreme pharyngeal protraction during prey transport (b). Moray eels are large predatory fish that are found on coral reefs world-wide and yet little is known about their feeding mechanics. In studies published in 2007 & 2008 I describe a novel prey transport mechanism in moray eels (pharyngeal transport, Fig. 1). My study revealed that morays have a reduced capacity to suction feed and apprehend their prey by biting. When the prey item is apprehended in their oral jaws, morays protract a pair of pharyngeal jaws, located behind the head, into their oral cavity. Once in the oral cavity, the pharyngeal jaws bite down on the prey item and transport the prey into the esophagus. The moray transport mechanism is the first alternative prey transport mechanism to suction reported in an aquatic vertebrate and the first example of a vertebrate using a second set of jaws to grasp and transport prey from the oral jaws into the esophagus. The transport behavior of morays is also convergent with the prey transport mechanism used by snakes. Similar to snakes, moray eels are large elongate limbless predators that have evolved a strategy for ratcheting down large prey. However, rather than ratchet from side to side using independent movement of the left and right jaws like a snake, morays ratchet from front to back using independent movement of two separate jaw systems. Since these papers, I have documented the biomechanical diversity of the oral jaws of various moray species. The majority of morays swallow large prey whole, although some morays process their prey in their oral jaws before ingesting them. One might imagine that swallowing large prey whole requires specialized adaptations of the digestive tract. My present goals are to understand the digestive physiology of consuming large prey whole versus consuming chunks of prey, two strategies seen in the feeding ecology of morays. The teleost skull is one of the most heavily studied functional units among vertebrates and has been used as a model for numerous biomechanical studies, however, the majority of these studies focus on suction feeding. Although suction feeding is considered the most commonly used prey capture mechanism across aquatic vertebrates, biting as a prey acquisition strategy has evolved independently in several teleost clades. The evolution of biting appears to have had an effect on the transport and respiratory complex for some of these biting taxa. For example, during my postdoctoral research, I discovered that moray eels, a species rich clade of anguilliform fishes, do not rely on suction to feed, but apprehend their prey by biting. In addition to biting their prey, I found that morays have evolved an alternative method of transporting their prey (see Recent Research section). This functional innovation in moray transport behavior provides an opportunity to examine how functional innovations in integrated systems arise. I hypothesize that the evolution of biting has had downstream effects on different modules comprising the cranio-musculoskeletal system of teleosts. My current research, funded by the National Science Foundation (IOS -0819009), investigates trait correlation in the teleost skull. In this body of work I examine three distinct modules, or developmental complexes, of the teleost skull: the oral jaws, the hyobranchial system, and the opercular series (Fig. 2) in anguilliform fishes. I am specifically interested in documenting how changes in the oral jaws (i.e. 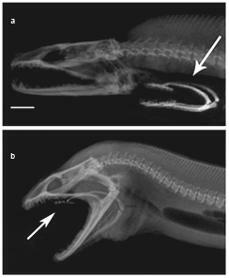 extreme elongation as seen in many biting taxa) affects the hyobranchial and opercular system which may result in functional specialization and novel prey transport and respiratory modes, as observed in morays.